1999 "Big, Bulky, Furry Headcovers Anyone?" Well, not for me, thanks... but I do owe a debt of gratitude to them. Innovagolf.com began, as many companies do, with a need. I needed some golf club head covers that wouldn't take up so much space in my bag. 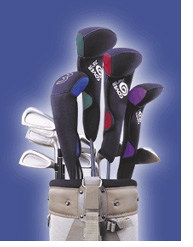 I carry 4-5 woods, and you can imagine what my bag looked like with big furry head covers jammed in it. To my surprise, my search was long and difficult. The only option I found were knitted headcovers. Very nice, but at $50 a pop, they were out of my league. Not to mention, I cringed when I thought about a little rain on my $200 investment. I had about given up when an issue of PGA Tour Partners Magazine showed up at my door, and lo and behold, in the product testing section lay my answer. A brand new head cover made of Neoprene and custom sized for my different woods- specifically designed, the magazine said, to take up less space in a golf bag! Eureka! It wasn't long until ClubHeadCover.com began to produce some fairly impressive results. The response to CoverUpz was overwhelmingly positive and word began to spread around friends and foursomes. During my relationship with Gotcha Covered! I learned about the struggle of pushing golf products through to the big golf retailers. The Golfsmiths, GolfUSAs, and Edwin Watts of the world seem to have little interest in products that don't already have tens of thousands of marketing dollars "pulling" them through the shelves. To them it is simple. What is a golf store without Titleist? Vs. What is a golf store without CoverUpz head covers? Understandable for them, as shelf space is at a premium. But who really loses? We, the golfers, in my opinion. It wasn't long until I began to wonder... were there other companies like Gotcha Covered? Were there companies with amazing products that weren't getting proper exposure because they didn't have tens of thousands of marketing dollars? In 2001 we set off to the granddaddy golf show of them all, the PGA trade show in Orlando Florida, to find the answer. It surprised even me. There were HUNDREDS of golf products at the show that I had NEVER seen or heard of (some for very good reason!) Many of them I felt were truly useful, and I thought it was a shame that I had never had the opportunity to experience them. Marketing products like these became our mission as we launched innovagolf.com - Innovative Golf Products You Can Use. Things came full circle for Innovagolf in 2004. We aquired the golf head cover division of Gotcha Covered and now manufacture CoverUpz, which we believe to be the finest quality golf head cover on the market. So, yes, now I can say that "I loved them so much, I bought the company!" just like Victor Kiam! I love this old commercial with Vic and Doug Flutie (I am surprised Doug's acting career never took off). In addition, we have helped launch countless products into the marketplace, including Skycaddie, SuperStroke putter grips and Visiball glasses, each with now more than 1 million units sold. Today we represent over 200 unique and useful golf products. And, if you make or know of one we don't offer, we want to hear about it! We hope you enjoy our store. We are proud of the results of over a decade of fun and hard work. A part-time hobby had grown into a full time family business thanks to a loving God, a supportive family, many wonderful customers, not to mentioned some great companies that make some great products. One of my favorite things in the last several years has been sharing our business with our two boys who love to golf and are growing into young men. This video is of my oldest Nicholas, helping test a new golf trainig aid called the Rope-It. He enjoys helping me select the best products to feature at Innovagolf as much as I enjoy he and his brother Matthew being a part of it all. Thanks for finding us...we hope you will come back!